The Sports Welcome Bonus is a €25 Free Bet. To qualify, any new player simply makes a deposit followed by a wager at 1.5 odds or higher. Whether the wager wins or loses, youwin.com will return the stake in free bets up to a maximum of €25. 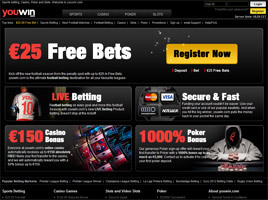 Applicable to a wide selection of spots and markets, the free bet amount is credited to the player’s account within 24 hours and must be used within 30 days. Based out of Malta, youwin.com is an online sportsbook with sections for casino table games, slots, and poker. It is owned by WINunited, Ltd., operated primarily in English, and features both downloadable software and an instant play version. Its basic applications are powered by NetEnt and Finsoft, with the poker rooms linked into the Entraction Poker Network of Entraction Holding AB. Denominated un Euros, funds transfers are permitted and easily enacted between players’ main sports betting accounts and their casino or poker accounts. Once initial sign-up and deposit of funds has been achieved, no additional registration or financial set up is required. In the Sports section of the youwin.com web site, all manner of sports betting is welcome. There are markets for football, golf, and even UFC 120 fights. Darts, cricket, and snooker are represented, as are Rugby Union and Rugby League. Followers of tennis, Formula One, and Moto GP will not be disappointed. More exotic and unusual sports can be bet on in season, including handball and volleyball. And America’s favourite pastimes are featured, too, from the U.S. version of football to baseball, basketball, and ice hockey. In addition to the English Premiership and the Champions League, La Liga and Budesliga have their own separate tabs for football wagering. There is also a tab just for “live betting,” where real-time wagers are accepted as sporting events are in progress. The youwin.com Sports oddsmakers pride themselves on offering ultra competitive prices for sports bettors and invite comparison with those of the “big four” bookmakers. In the Casino section, more than 70 of the most popular casino games have been gathered. There are slots ranging from 3-reel classics to the very latest releases, such as Gonzo’s Quest, Diamond Dog, Super Lucky Frog, Blood Suckers, and Wild Witches. Video Poker is available, too, as are table games—Blackjack and Roulette. Games can be sampled in the Free Play mode prior to joining without any downloads. The youwin.com Poker rooms offer continual Sit & Go tournaments with an ongoing €30,000 leader board competition as well as ring games (cash games). At any given time, more than 3,000 players may be seated at over 200 tables. Eight different versions of poker are played here: Texas Hold’em, Omaha, Omaha High/Low, Sökö, 7-card Stud, 7-card Stud High/Low, 5-card Draw and 2-7 Triple Draw. In the Poker section of the web site, a whopping 1000% Welcome Bonus is offered up to a maximum of €5,000. To qualify, the new player must download the site’s poker software, make an initial transfer into a new Poker account and send a confirmation email. Thereafter, the bonus cash is credited at a rate of €1 for every 10 VIP points earned within 30 days from the date of funds transfer. Poker VIP points are earned at a rate of one point for each €0.50 contributed in rake. VIP-points are rewarded for participation in tournaments, too, at one point per €0.50 paid in entry fees. In the Casino, a €150 Signup Bonus is available to all first-time players. It is offered as a 50% first deposit bonus on initial funding of up to €300, which translates into as much as €150. To get the bonus, players must be a youwin.com member and transfer no less than €20 into the casino account. The welcome bonus is credited on the spot—no waiting period. One other generous promotion in the Casino is called “Tuesday Happy Hour.” Players who make a casino deposit any Tuesday between the hours of 10am and 5 pm CET receive a 25% bonus. That’s not just for the first deposit but for all deposits made during those hours. The initial deposit is matched immediately and all subsequent can be claimed via email or via live chat. The minimum deposit is €1 and the maximum is €100.